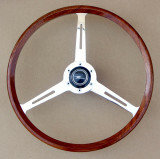 Most of these steering wheels are replicas of special original factory offerings by Healey. Click on any of the galleries for additional pictures. Very nice web pages and informative. When I get chance I will take a longer look. 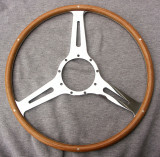 On my 69 Sprite I have what is turning out to be quite a rare early Mota Lita wheel. 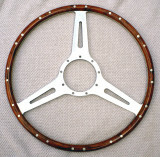 It is rare because it is the early small boss wheel not the standard boss wheel that is still in production. It is 13" and flat which is exactly what I wanted and even the wood is of alternate layers of dark and light grain wood looking to be nicer than the plywood rims they knock out at Mota Lita nowdays. The boss was non-standard and had to be modified by drilling out to a larger size and then broached and takes the lightning flash horn push. 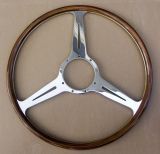 Local machine shop has the broaches for both early and late Spridget steering column splines and does some sub contract work for whoever is making replica wheels of one type or another. If you are interested I could dig out a digital picture to send you.